Chicago skyline showing lights and view from Lake Michigan. A day of fun-filled activities in the Windy City deserves a fitting end. 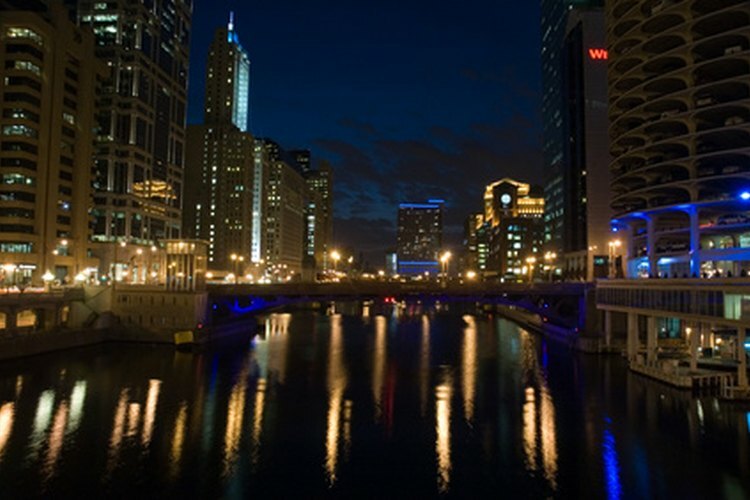 Midnight in Chicago offers splendid views of city lights and fun for all kinds of travelers. Don't forget to have your midday siesta, because you'll want to be awake for all the midnight fun Chicago's varied nightlife has to offer. Forgo the public transportation and go on a midnight bike ride or run around the windy city and enjoy city lights. Stroll or bike the Marvelous Mile for a change of pace and respite from day-time crowds. If you prefer a group setting, join Chicago's Midnight Marauders for regular after-midnight rides around Chicago and get your after-hours exercise in. Although it's made up of tough, experienced riders, the group is welcoming and the outings are open to all. Depending on the theme of each ride, the starting location and 11:30 p.m. starting time can change, so be sure to call ahead for confirmation. Troll the city for late night comedy clubs and reap all the health benefits that laughter has to offer. Area theaters, iO Chicago and the Playground, go on with the show long after other theaters have closed the curtain for the night. Both theaters have Friday and Saturday nighttime shows, so give yourself the gift of laughter and head home smiling. If you're feeling courageous, step on stage with the professionals and try your hand at comedy in iO Chicago's "Improv Jam." All proceeds from iO Chicago Theater's Friday night "Improv Jam" go to charitable causes. You'll likely want to find a healthy eatery in the area open after midnight for your late night excursion. Serving up organic coffee and vegetarian fare to a late-night hipster crowd, the Pick Me Up Cafe, a 50s style vintage cafe in Chicago's Lakeview area is open 24 hours on weekends, and until 3 a.m. during the week. Bottomless cups of organic coffee and guilt-free vegan and vegetarian snacks for late night chats with friends can't be beat, but be sure to ask for the non-smoking section. Check local theaters' midnight showing schedules in print or on-line and enjoy a late night flick. For fun and culture rolled into one, head over to the Music Box Theatre to pay your respects to the "atmospheric" architectural style and stay to catch a midnight film. The theatre's blue ceiling with twinkling stars and moving clouds suggests a night sky, while the plaster details, round towers, and organ chambers more closely resemble an Italian courtyard, thus making you feel like you're watching a movie in an open air palazzo somewhere far, far away from the windy city. On Fridays and Saturdays, there are two midnight showings of two different films, often independent films and cult classics. Don't forget to watch out for the theatre's in-house ghost, Whitey, who was a former manager. Find a favorite Chicago spot, well-lit and safe of course, and settle in to train your brain. Read a book or a newspaper or do a crossword or Soduku. Write your mom or your best friend a postcard or a letter about your Chicago experience. If you're desperate for the newest in a rare series, on the hunt for unusual books, or just feel like book shopping at midnight in the Chicago-land area, get out to Wicker Park and visit Myopic Books. Open late nights 7 days a week, this book shop boasts a huge selection of new and used books, as well as comics, graphic novels, occult novels, a second-floor seating area and very clean restroom facilities for the late-night book-worm.